Here it is the end of November and Nashville is dealing with some warmer weather. The past week its been cool (32-35) in the morning and warms up around 10 to about 50 degrees so that I can open the door to the deck and Lily can go out. This morning at 7:30 it was already 51! And we have rain. Welcome to the world of Global Warming. 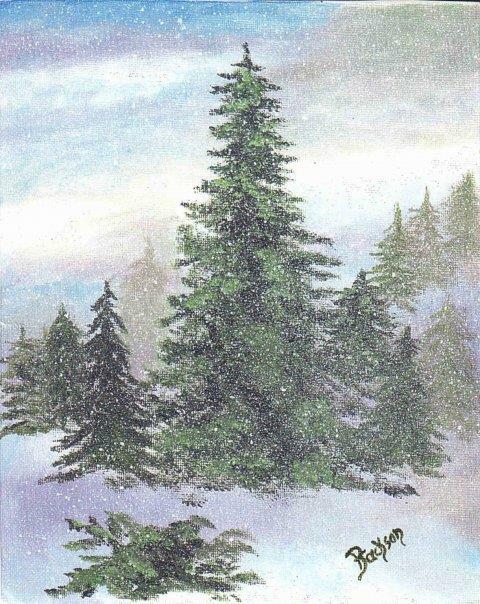 Years ago when I was in paint class I painted my first Christmas card. What I mean by that is I painted a scene and I had it printed for my card. This is my first Christmas card. I am now working (and I am behind) on this years card. 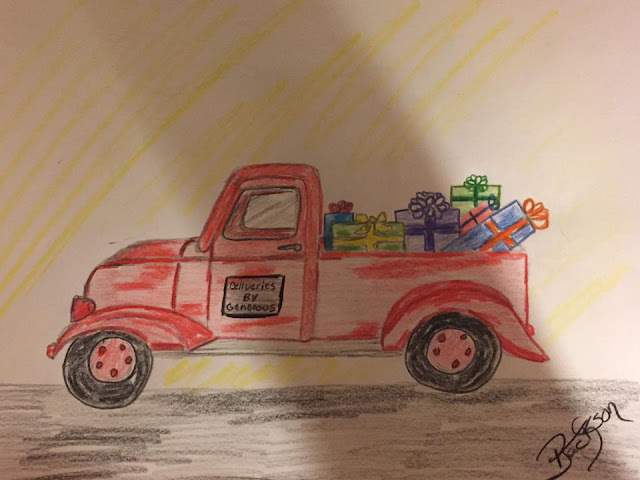 For the next few (14) days I will post the cards over the years. By the time I am done, I should have this years painted. I will not post it though until it goes out in the mail and has been received. I was very proud of my first card. I sold the painting years ago but the above is a pic of the printed card. Morning... Today I am playing along with Michael's Blog http://dottyhill.blogspot.com/ in Scribble Picnic. Jump over and check the art of others out. Thanks for stopping by and be sure and take a look at the post earlier today. My mom gave me this pendant that she used to wear to work. She picked it up at a yard sale years, years, and years ago! Apparently it used to have a coin in the center. You can't tell from the pic but around the inside of the turquoise beads is Amethyst stones. My birth stone. But like I said before, I like my earrings and necklaces to match. So off to Hobby Lobby I went and this is what I pulled together to match. Close enough. Sorry....no pic of the chair before but it was just wooden, not pretty at all. So I painted it black and started free handing a design on it. Candlesticks made from the legs of an antique table. My mom gave me a couple of sweatshirt type of shirts that was too tight for her. A black and gray one. Here is the black one mom gave me. Sorry about the blurred pic. Hard to believe that I am a photographer! Anyway, seating here last night when I could not sleep I decided that black shirt needed something to make it stand out better. Buttons.... yes buttons would work just nicely. So I put some up around the collar. And here is a pic of the sleeve. I really enjoyed working with washers. I had a bunch on hand when I started working with them. I love scrapbook paper if you have not noticed. 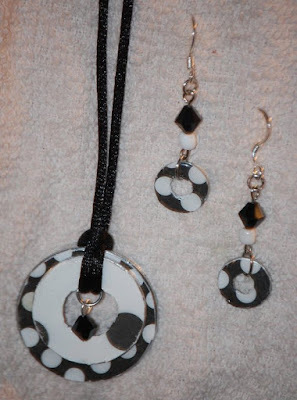 This set was made with washers and scrapbook paper. This piece was made with beads I had on hand..... (secret is....I have TONS of beads). The dangling part at the end of the necklace was a piece I recycled from another necklace that had broken. I just thought this piece is great for a teen. Mom had picked up some pieces at a yard sale and the arrow head was in that bunch of things she got. Earrings.....beads on hand. the royal blue, green, and the purple ones are made with glass beads. I loved this piece I made for one of my co workers at the Bureau. 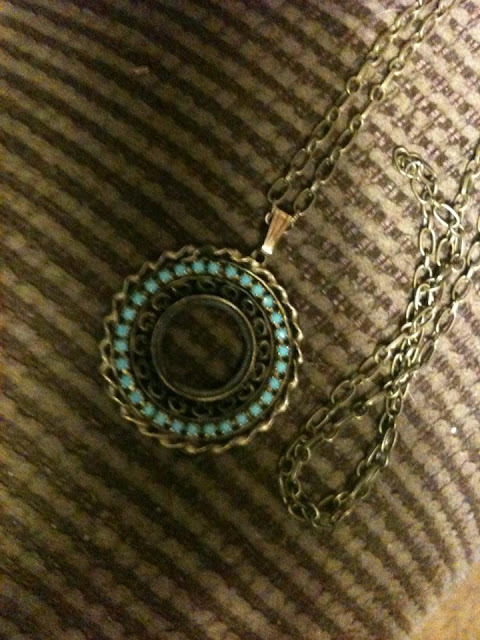 The piece on the necklace was yet another recycled piece. Looks like two moons connecting. I attached the pearl to it.